Quality and beauty come standard with the BW-02-XL freestanding modern bathtub. This stone resin stand alone tub features a perfect blend of modern styling and simple elegance for a timeless look that is both durable and easy to clean for years of bathing serenity. The modern design of this deep bathtub is met with lush depths that cradle you in warmth and luxury for a papering, full immersion experience. Crafted of acrylic polymer and natural minerals, this resin bathtub retains heat while remaining unaffected by external forces such as moisture and humidity making it an ideal high quality material. Add bold style and elegance to your bathroom with a quality stone tub that resonates luxury and class. I am truly enjoying the beautiful Badeloft tub in my new home! When looking at tubs for our master bathroom we wanted a… roomy tub without any jacuzzi effects that would also stand out visually in the bathroom. 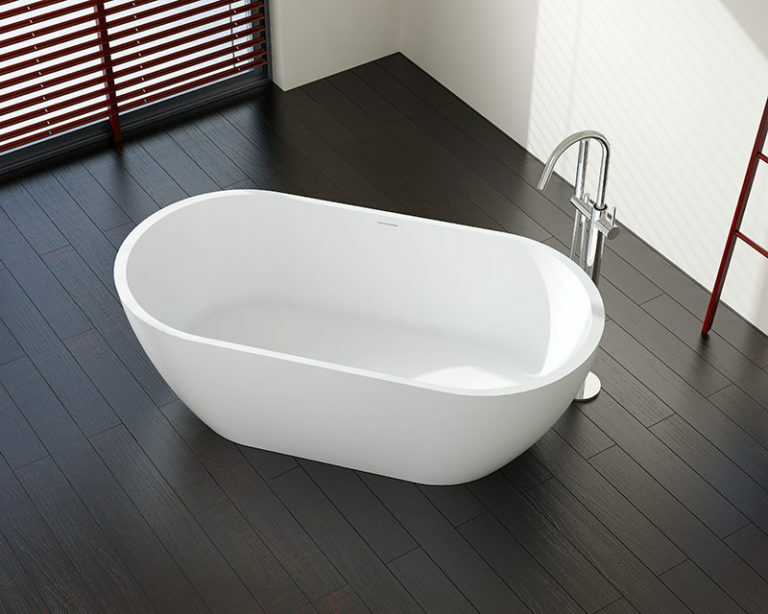 My builder pointed me to the Badeloft site and we ordered the BW-02-XL tub in the matte finish. It looks stunning! Everyone that comes for a house tour always points out how beautiful it is, and I have to say the tub together with the tiles really makes the bathroom. One concern I had when looking at tubs was to make sure the water level was deep enough for a comfortable bath (living in Japan years ago we were a bit spoiled with deep baths). The model I have is plenty deep and I don’t even fill it to the max fill level to be comfortable. I haven’t been in the house a month yet, but I have already enjoyed many baths! And value for money was also great on this product in my mind! There are many lesser tubs out there in this price range! I did a lot of research on freestanding tubs for our remodel. 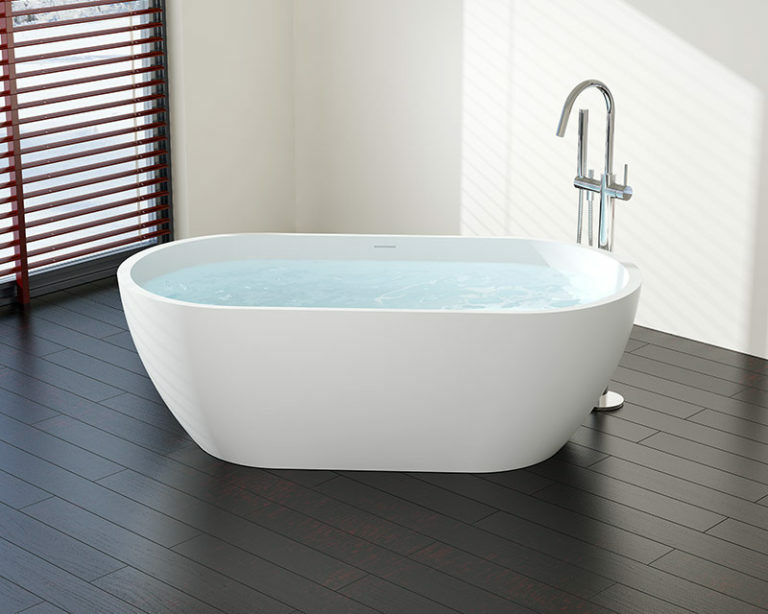 I knew wanted a tub that was simple, modern, and well-buil…t. Most of the tubs I liked were way out of my price range, too bulky and overly designed. The lower priced tubs were all acrylic and just felt cheap. I came across Badeloft and I fell in love with their selection and pricing. I thought it was too good to be true. So I ordered a sample and was totally impressed with the material. It was exactly what I needed. The customer service at Badeloft gets 5-stars. I was taken care of and all my questions were answered. I felt very good about ordering from them. The bath looks great. The design of the tub is simple and airy yet it feels like stone. I absolutely love it. While building our house, we found the Badeloft tubs when searching on-line for a centerpiece to anchor our master bathr…oom. The style of tub we knew we wanted by other european designers where prohibitively expensive, but the price of the Badeloft seemed almost too good to be true. We contacted them, and received samples of the materials within a couple of days. We were happy to find out about the showroom in Sausalito, which is fairly close to our house…so we went to visit. We were warmly greeted by Tyler who is one of the owners of the new US distribution of the Badeloft line. They have a limited selection of very high quality tubs and sinks…and all of them have very clean lines and a modern look. We were able to sit in each tub…some of their models were incredibly ergonomically designed and amazingly comfortable. Ultimately we decided on a very clean and simple design to match our aesthetic. Tyler was very nice, and really helpful about getting us material samples, cut sheets and everything else we needed to make an educated decision. The resin used in the tub is the same quality you will find in the more expensive brands…and the design is equal in aesthetic and possibly even better in comfort. We ended up going for the BW-02 XL with a matte resin finish, two matching sinks and a floor mounted tub filler. Everything was delivered directly to our construction site, in nice packaging, and the delivery guy was great, happy, and friendly. Then all we had to do was figure out how to get a 450 pound tub to the second floor. We couldn’t be happier with the end result, and we saved a lot of money by going with Badeloft. We’ve recommended it to friends who were remodeling their home, and they’re also very happy with their Badeloft tub. If you are hesitant to buy one of these without visiting the show room, rest assured, they ARE as good as they look…you won’t be disappointed.